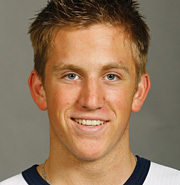 Jordan Schroeder turned heads with his play at the 2008 IIHF World Junior Championship. Sacrifices are nothing new for an elite athlete. Jordan Schroeder of USA Hockey’s National Team Development Program knows first hand the kinds of sacrifices that must be made in order to pursue a dream. From a young age, Schroeder has been obsessed with hockey and has made the necessary sacrifices to reach his goal of playing at the highest level. In eighth grade, he left his hometown of Prior Lake, Minn., and headed to St. Thomas, a Minnesota military academy. While he did not choose to follow the military route, the lessons he learned in such a structured and disciplined environment proved to be invaluable throughout the early stages of his hockey career. “It taught me to have discipline and how to follow directions,” the 17-year-old says. Add the fact that during his freshman year of high school, the St. Thomas Cadets won the 2006 Minnesota State High School Hockey Championship, and Schroeder certainly has fond memories of his days in uniform. Later that year, he again left all that was near and dear and headed to Ann Arbor, Mich., to join other topnotch players from around the country at the NTDP. Like the majority of his comrades at the NTDP, the honor to join the program came with the price of a completely new and unfamiliar life. His passion for the game of hockey is evident in his statistics. Last season, he totaled 52 points in 56 games while splitting time between the Under-17 and Under-18 teams. He has already had a great start to this season with the U-18 squad, netting a hat trick and adding two assists in a breakout performance against Finland at the Four Nations Tournament in November. “Overall, [coming to the NTDP] wasn’t that hard of a transition because I love it so much here." He followed that up with a stellar performance (1 goal, 7 assists) with the U.S. National Junior Team at the 2008 IIHF World Junior Championship in the Czech Republic. What the 5-foot-8-inch, 165-pound Schroeder lacks in size, he more than makes up for with speed, playmaking ability and pure drive. In another display of his commitment to the game, Schroeder has accelerated his education and will give up his senior year of high school so that he can continue playing at a higher level. He hopes to finish the curriculum in time to attend the University of Minnesota next fall, where he has verbally committed to play hockey for the Gophers. With his continuous habit of making sacrifices for hockey, Schroeder looks forward to reaping the benefits of his discipline by joining the very team that he grew up idolizing back in Minnesota. He can once again hang out with his hometown friends and head “up north” to his family’s cabin. As he looks forward to leading as normal a life as a young phenomenon can, Schroeder savors his experiences and his time left at the NTDP.